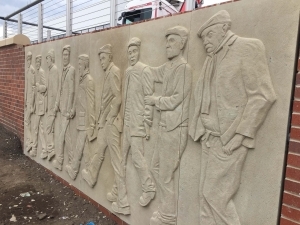 The relief carving of the railway men that I have been working on over the last few months was installed in the Brightside area of Sheffield last week. The 4.5m long carving of the life sized industrial figures now rests in a perimeter wall of a new BMW premises in Sheffield. In the former heart of the steel making area of the City, the sculpture remembers the characters and close knit relationships of the workers who would have worked in this part of Sheffield, when the railways were in their pomp, over a hundred years ago. 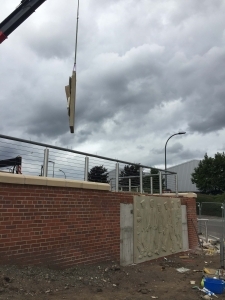 The 6 panels of the sculpture were lowered into position and attached to a concrete wall. As ever, installation is a nervy business, thankfully there were no hitches as everything went to plan. All that is required is the contractor to cap the wall and carry out some landscaping around the work. I will add some more images once this is complete.